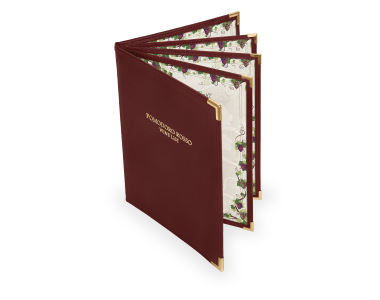 A distinctive and traditional presentation that speaks to the quality of the offerings inside. A new and exciting presentation that reflects a fabulous dining experience. 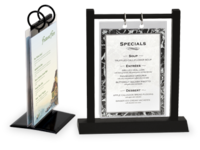 Promote even more drinks and specials with our Three Sided Table Tents. Note our NEW size that holds 3.75 in. x 8 in. 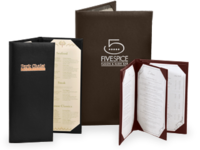 inserts, PERFECT for beverage lists, dessert or appetizer menus. 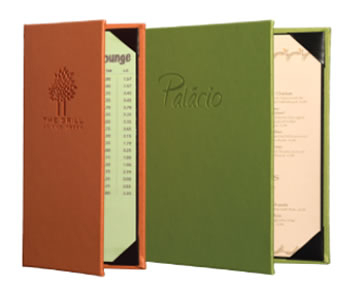 Rigid, hard backed menu covers with clear inside pockets are an excellent product at an excellent price. Try our Show Off Flip Stand. 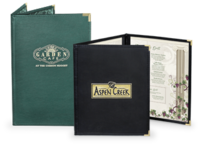 For over forty years we’ve been supplying quality menu covers to restaurants across the United States. We learned our trade in New York City in the early 1970s with unique menu designs for upscale haute cuisine dining rooms, brasseries, bistros and steakhouses that filled the City, menus and menu covers that helped each of our customers to establish their unique identity or branding. During the 1980s and 1990s we extended our service and marketing area to include the Caribbean. Hog Penny Restaurant and Barracuda Grill in Bermuda, Blue Moon Restaurant in Trinidad, Blossom in Aruba, Dorado Beach in Puerto Rico and Caneel Bay in the U.S.V.I., just to name a few. In 2000 . . . BOOM!!! 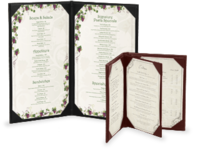 The internet opened up and we had to develop a full line of menu covers, wine lists, drink menus, bar and dessert menus as well as table top card holders all designed for economy as well as style. We got a geography lesson, shipping to places we had never shipped to before: Bite Me Fish Market in Kailua-Kona, Hawaii; Black Fedora Comedy Mystery Theatre in Charleston, South Carolina, Acme Oyster House in New Orleans, . . . all the while still catering to restaurants like The Carnegie Deli in New York City, Corinthian Yacht Club in Tiberon, CA, Philadelphia Yacht Club in Philadelphia and the Marriott Hotel in Boston, Mass. We’re proud to say, that in the last 10 years we’ve shipped to over 100 casinos, 40 Chick-fil-A restaurants, 37 Marriott Hotels, a ton of Johnny Carino Restaurants, 60 Hilton Hotels, 35 Retirement Communities and a whole bunch of Steak, Ribs, Seafood, Tex-Mex, Chicken Shacks, Wine Restaurants, Hamburger Palaces and Beer Halls in the United States and Canada. Oh yes, and one order from a customer in Darwin, North Territory, Australia . . . although we must admit, the freight to get it there cost more than the merchandise. To sum up this long-winded, self-aggrandizing essay, what we’re trying to say is that we’ve got the products. We stock all of the popular sizes in many of our products: 5 ½” x 8 ½”, 4 ¼” x 11”, 8 ½” x 11”, 4 ¼” x 14” 8 ½” x 14” and 11” x 17”. We can make custom sizes in almost all of our product lines. Our customer service people are pleasant, courteous and they will be happy to answer any questions you might have . . . and our prices are the best on the web. "I placed my order online on Monday and by Friday the goods had arrived at my shop in Canada. I will use The Menu Shoppe again." 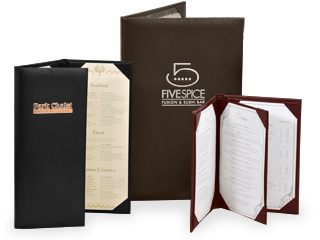 Menu covers with turned and finished edges featuring our exclusively manufactured imitation leather. The gold standard for upscale dining rooms. 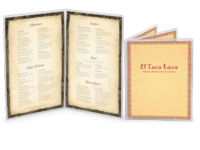 Restaurant menu covers with clear panels double stitched to leatherette or fabric binding, metal corner tabs. Custom sizes available. 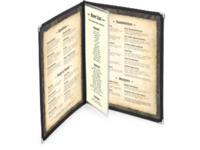 Clear Vinyl Menu Covers, hold and protect your menus WITHOUT binding. 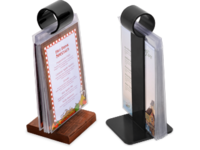 Our A-frame table tents in imitation leather, vinyl or clear acrylic. Table tents hold two inserts, back to back, for double sided viewing. Plus see our NEW 3-Sided Table Tents. 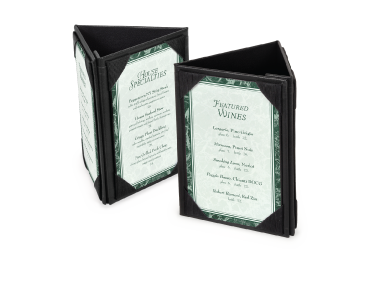 A selection of case made fine dining menu covers with interior corner tabs to hold your menu. 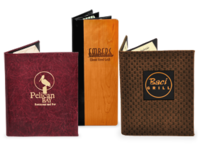 Choose from Bonded Leather, Solid Wood, Genuine Cork, and many other materials. 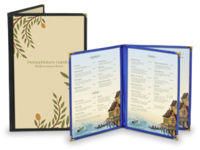 Menu covers with screw post binding designed to hold up to twelve clear plastic sleeves, or twenty-four viewing sides for extensive menus. A variety of wood, acrylic, and metal table top card holders hold several display cards to promote ALL your services and products. 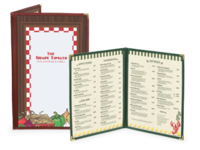 A collection of tall and slim menu covers in sizes especially designed for limited menu content and seating areas. 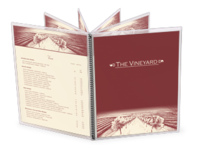 Clear Vinyl Pages are spiral bound together for an attractive and affordable menu cover both you and your guests will appreciate. Change your menu as often as you would like. 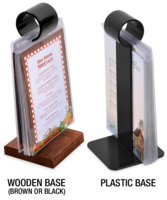 Our New Show Off Menu Holders are the perfect way to advertise multiple specials and promotions. to make them available for quick shipping. 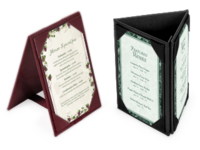 Cafe Style Menu Covers, In stock in 4 colors and popular sizes and configurations for immediate shipment. 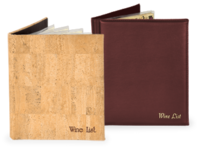 Wine Lists - Covers and Captain's Books provide your wine list with an air of sophistication. 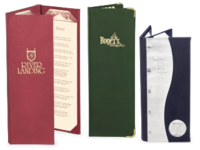 Looking to add an extra page to one of your menu covers with clear pockets? Our Add On Pages are just what you need. We aren't just menu covers! 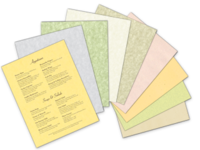 See our blank parchment, fiber and vellum-style menu papers. All are laser and inkjet printer friendly.